The seemingly limited information being provided by both the government and the operating company, Tokyo Electric Power Co. (TEPCO), about the ongoing disaster at the crippled Fukushima Daiichi nuclear power plant is a source of widespread public concern. However, a nonprofit organization focused on nuclear power issues and founded in Tokyo in 1975 — and which includes among its contributors former engineers at such power plants — has been clearly presenting expert analysis of the situation since its inception with the megaquake and tsunami that struck the northeast of the country on the afternoon of Friday, March 11. The organization, named the Citizens’ Nuclear Information Center (CNIC), has provided information and opinions throughout on its website, and has also been holding daily press conferences to disseminate what it comes to know. One thing that has emerged above all else is the public’s astonishment — and many experts’ incredulity — that this nuclear plant and others in Japan were ever sited in the quake-prone places they were. Masashi Goto, a former nuclear plant and containment vessel designer with Toshiba Corp., which manufactured four of the six reactors at the Fukushima Daiichi (No. 1) plant in the 1970s, said at a CNIC press conference held at the Foreign Correspondents Club of Japan (FCCJ) in Tokyo on Monday, March 14, that he decided to speak because he realized — after seeing the explosions at the reactors — that their design was not able to tolerate such earthquakes. 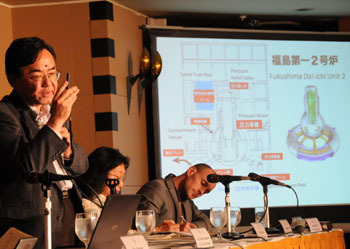 At the same FCCJ event, Goto also explained that the cooling systems for the Daiichi plant’s reactors had been damaged in multiple ways by the earthquakes and tsunami, which triggered serious incidents one after another. And although TEPCO, the Self-Defense Forces and other agencies have been striving to pour water into the containment vessels to cool their radioactive contents, Goto said it might now prove difficult to cool down the fuel rods. In the middle of the press conference, TEPCO announced that fuel rods in Fukushima Daiichi’s No. 2 reactor were completely exposed to the air and were heating up. Learning the news, Goto said that that was quite a dangerous condition. When a reporter from the foreign media asked Goto what he thought was the possibility of a meltdown of the core, he reiterated how dangerous a situation it was, and said that he couldn’t deny that possibility. CNIC and Goto also criticized the way that information was being provided by TEPCO and the government. Goto said the government should predict possible accidents and inform the public of such worst-case scenarios. “Unfortunately, however, the government is just following what happens and offering explanations,” Goto said. As regards the No. 3 reactor at Fukushima, which was emitting high levels of radiation, Chihiro Kamisawa, a CNIC staff member, noted that that reactor uses MOX fuel — whose melting point is lower than that of normal uranium fuel. Also at the FCCJ press conference, a reporter from a news magazine asked Goto, the former Toshiba engineer, why his concerns over the earthquake resistance of its nuclear reactors had not been shared by Toshiba. Goto said that some of the company’s engineers simply hadn’t believed such huge earthquakes could ever happen, while others had believed the reactor containment vessels would remain intact even if a major earthquake damaged the buildings housing the reactors. 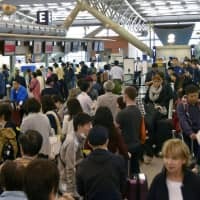 The concerns expressed by Goto and CNIC staff at the FCCJ the previous day started to become even more real on Tuesday, March 15, when Fukushima’s No. 4 reactor, which had been shut down for maintenance when the quake struck, caught fire — and then there was a small explosion at the No. 2 reactor that damaged the suppression chamber, which is connected to the pressure vessel containing fuel rods. The suppression chamber stores water to cool the steam flowing from the pressure vessel and thus relieves its internal build-up of pressure. At that day’s CNIC press conference, also at the FCCJ, Goto said that what he had been afraid of, a hydrogen explosion, had probably occurred at the No. 2 reactor. 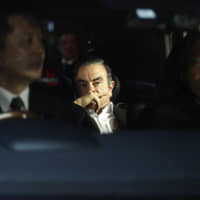 He explained that the water level in the reactor’s containment vessel was going down and the uranium rods were heating up, seemingly because TEPCO staff were unable to pour water into the vessel as the pressure inside it was too high. He said that led him to think of two of the scenarios he most feared. “One is explosions caused by the gases generated if the melted debris of fuel rods destroys the bottom of the pressure vessel and reacts chemically with the concrete of the floor,” Goto said. “But a more severe scenario would be a resumption of criticality (from that which is part of the normal operation of a reactor) triggered by an accumulation of that debris in a confined space,” Goto said, referring to the occurrence of nuclear fission, and with it the release of large amount of neutron radiation. A criticality incident that killed two workers occurred in 1999 in Japan at a private nuclear fuel-processing company named JCO Co. in Ibaraki Prefecture. At the same press conference, however, CNIC staff member Masako Sawai said that one of her main concerns was over the pool holding spent fuel rods at the shut-down No. 4 reactor. Those rods had heated up and caught fire, and Sawai explained that spent fuel must be cooled at all times by continuously pumping water into the pools and circulating it. “But all the water and pumps are probably being used to cool the No. 1, No. 2 and No. 3 reactors that were in operation. So the lack of water and pumps seems to have caused problems with the No.4 reactor,” Sawai said. She added that one of those spent fuel-rod pools stores several times more nuclear fuel than that in a reactor core — and that the spent fuel in the other reactors at the Fukushima Daiichi plant may also be in a dangerous condition. Then the following day, Wednesday, March 16 — when white smoke rose from the No. 3 reactor and a monitoring post near the main gate of the nuclear plant registered radioactive emissions of 10 millisieverts per hour (around four times the amount to which an ordinary person is exposed in a year) — another former Toshiba engineer spoke at that day’s CNIC press conference at the FCCJ. Shiro Ogura, an engineer involved in the design of the reactors at the Fukushima Daiichi plant (which is built on two nearby sites, one with four reactors and the other with two), said that his bosses had told him that earthquakes of magnitude 8 or more could never happen, and so there had been no planning for such contingencies. Neither had the company factored tsunamis into the design of nuclear power plants, he said. “Right before my retirement in 2002, the company reviewed for the first time whether plants can operate in case of a tsunami. But the size of tsunami that the company presumed was much smaller than that of this time,” Ogura said, adding that he does not remember the exact data. 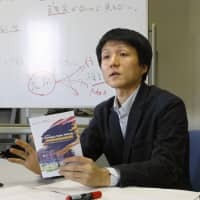 Concerning the earthquake resistance of nuclear power plants, Goto maintained that electricity companies, nuclear power plant manufacturers, and the government have ignored the possibility of huge earthquakes that scientists had warned about. “If the authorities decide to build more nuclear power plants, they should set (earthquake resistance) criteria based on a thorough examination of any possible natural disasters,” Goto said. Then on Thursday, as GSDF choppers dumped water to cool the spent nuclear fuel rods in a storage pool at the No. 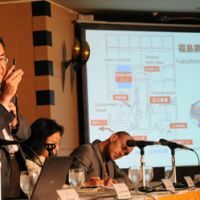 3 reactor, Goto addressed a press conference at the Diet, where he pointed out that it is possible that that pool was broken and water was leaking out. 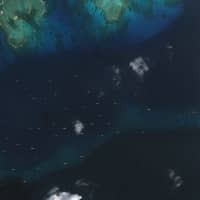 He continued: “If so, even if the GSDF succeeds in pouring water into the pool, they will have to pour water forever to cool the fuel rods in the pool,” Goto said. “It is not a safe situation at all, and they are on the brink of a crisis. That Thursday night, TEPCO announced that radiation levels near the reactor had gone down slightly, to 3,754 microsieverts at 10:20 a.m. from 3,782 at 9:40 a.m. following watering by the GSDF. And although GSDF helicopters were set to continue dropping water on the No. 3 reactor again on Friday, CNIC staff member Chihiro Kamisawa pointed to the very small drop in radiation on Thursday and said that the spent fuel rods might be evaporating the water as they heated, so inhibiting the rods’ cooling. Meanwhile, in addition to the FCCJ press conferences, CNIC also held others at its Tokyo office a couple of times every day after the quake, and also broadcast them on the live video-streaming website Ustream, as well as carrying live tweets from its viewers. Many of the tweets said the explanations given by Goto were easier to understand and more meaningful than those of the experts appearing on TV. And indeed, the number of Ustream CNIC viewers had reached 795,740 as of Friday evening.